Bluetooth connectivity allows for the monitoring of the battery status through a smartphone. 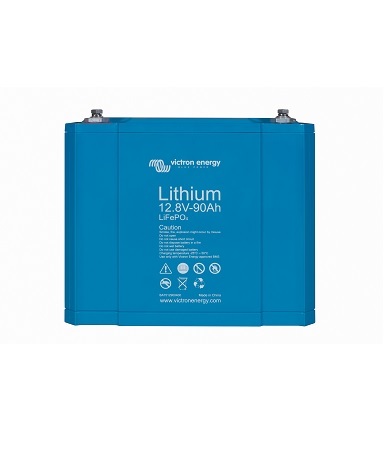 These batteries save up to 70% of the size and weight of comparable lead acid batteries. Use the options in the dropdown menu below to select the Amp Hour Rating required. Click on the “ADDITIONAL INFORMATION” tab below to see the available options for this product. Advantages: A LFP battery does not need to be fully charged. Service life even slightly improves in case of partial charge instead of a full charge. This is a major advantage of LFP compared to lead-acid. Other advantages are the wide operating temperature range, excellent cycling performance, low internal resistance and high efficiency (see below). LFP is therefore the chemistry of choice for very demanding applications. Efficient: In several applications (especially off-grid solar and/or wind), energy efficiency can be of crucial importance. The round trip energy efficiency (discharge from 100% to 0% and back to 100% charged) of the average lead-acid battery is 80%. The round trip energy efficiency of a LFP battery is 92%. The charge process of lead-acid batteries becomes particularly inefficient when the 80% state of charge has been reached, resulting in efficiencies of 50% or even less in solar systems where several days of reserve energy is required (battery operating in 70% to 100% charged state). In contrast, a LFP battery will still achieve 90% efficiency under shallow discharge conditions.